This Ruff Sawn Farmhouse Shaker Sideboard will add farmhouse style to your home! 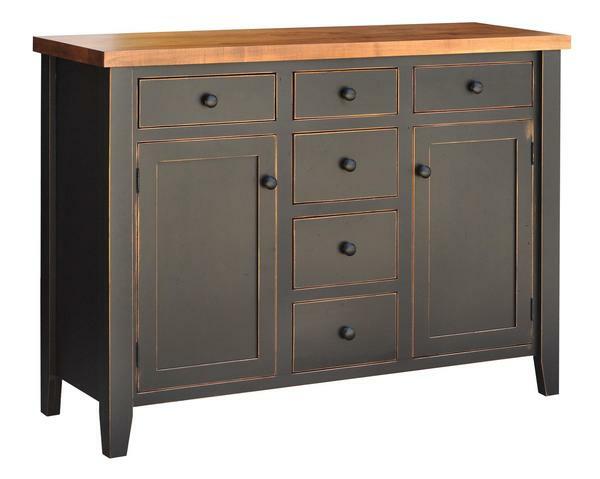 Crafted by hand by highly skilled craftsmen, this solid wood sideboard is made with heirloom quality for a piece of solid wood furniture that will last generations. Equipt with five drawers with full extension side mount drawer slides and two doors that contain two adjustable shelves. Customize this Ruff Sawn Farmhouse Shaker Sideboard by selecting a one or two-tone option and selecting from a number of finishes. Order stain samples today online or by calling a furniture specialist. Shown in Black Cut Back finish with a Hazelnut top,rustic smooth surface, multi-coated with a low sheen conversion varnish.